California Bookstore Day in San Diego! California Bookstore Day, on Saturday May 3, 2014, is a project of the Northern and Southern California Independent Booksellers Associations, representing more than 300 bookstores. This is an in-store celebration -- join us in either location to take part! CBD will harness the creative power of authors and publishers in a giant celebration of the written word that will drive readers to brick-and-mortar bookstores. For one day, and one day only, a number of very limited-edition, unique, word-based items and books will be available in more than 100 independent stores across the state. These aren’t your run-of-the-mill signed first editions—these are literature-based art projects, unique books, and collector’s items created for this event only. To learn more about other celebrations, visit California Bookstore Day's Facebook page. Some lucky CBD reader will acquire a reading bear! Join the party! It’s happening here. Throughout California ninety-three bookstores are promoting thirteen books and art pieces that have been specially published and produced for this special day. There will be no pre-sales allowed. Check out these one of a kind finds at cabookstoreday.com. The day will feature the Write Out Loud crew who will do dramatic readings from prestigious California authors, such as Ray Bradbury, Dr. Seuss, and Raymond Chandler. In addition, Mysterious Galaxy will host an afternoon spotlight with Kimberly Derting (The Taking), Alyson Noël (Horizon), and Margaret Stohl (Icons), three great young adult authors who will discuss and sign their latest and share their appreciation of independent booksellers and what we bring to our communities! The Greenfield Public Library is located at 5310 W. Layton Ave., in Greenfield. Three dynamic writers for teens present reads about fantasy, the supernatural and a romance between two high school misfits. From the author of the bestselling Immortals series comes Echo, the second installment of Soul Seekers, which follows Daire Santos, a young woman who inherits a magical destiny with roots in shamanism and a mission to stop a powerful family of dark sorcerers. But then she falls in love with one of them. The third book lands May 7th. Whispers at moonrise is the fourth book in the New York Times and USA Today bestselling Shadow Falls series. Kylie Galen attends a camp for supernatural teens, with the expected struggles of adolescence alongside the more unexpected surprises of life on the dark side. The highly anticipated finale, Chosen at Nightfall, will be released on April 23rd. “Eleanor & Park reminded me not just what it’s like to be young and in love with a girl, but also what it’s like to be young and in love with a book.” writes John Green in The New York Times Book Review. Read more here. About the Authors: Alyson Noel is the #1 New York Times bestselling author of many novels, including Evermore, Blue Moon, and Shadowland. She lives in Laguna Beach, California, where she is working on more books in The Immortals series, as well as a spin-off series beginning with the book Radiance. C.C. Hunter is a pseudonym for award-winning romance author Christie Craig. She is the author of the bestselling Shadow Falls series and lives in Spring, Texas, where she's at work on her new Glimmer series. 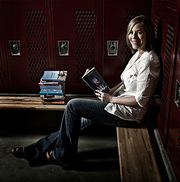 Works by bestselling teen fiction author Alyson Noël include The Soul Seekers Series, The Immortals Series, the Radiance Series, and non-series titles. Echo is the second Soul Seekers title, following Fated, as Daire Santos learns more about her abilities to navigate the worlds between the living and dead, and struggles with adversaries including family members. Wednesday, May 30, 7 p.m.
New York Times bestselling young adult fiction writer Alyson Noel will read from and sign her novel, Fated, the first in her new series, The Soul Seekers. Alyson Noël on tour for Everlasting. Alyson Noël's book Fated was available from LibraryThing Early Reviewers. Alyson Noël's book Evermore was available from LibraryThing Early Reviewers. Alyson Noël's book Cruel Summer was available from LibraryThing Early Reviewers. Alyson Noël is currently considered a "single author." If one or more works are by a distinct, homonymous authors, go ahead and split the author. Alyson Noël is composed of 10 names. You can examine and separate out names.